Monday, 31 December 2018, 12:00p.m. Police staff and volunteers are continuing a search of the shoreline. The search for a missing 16-year-old swimmer at Whatipu Beach is continuing today. Emergency services were notified on Saturday that the teenager had entered the water and had not come out. Police, Coastguard and other volunteers are still actively searching in the area. The police Eagle helicopter and Coastguard will conduct air searches throughout the day. Police are continuing to provide support to the teenager's family. He disappeared in the water after saving a woman - believed to be his sister - as she tried to rescue him. Witnesses said the 16-year-old let go of the woman as he was swept away. She had rushed to help after the boy got stuck in a rip around 1pm. "She swam out to him and they both got dragged out together," said witness Leah Lutau. "The young boy released her, he said go, he pushed her away. Then she was drifting in the water as well." Lutau, who heard the boy cry out for help while she was swimming but couldn't leave her children, said those on the beach were shouting advice to the woman as she struggled. "We said, float, float, lie on your back and she managed to swim in." Lutau said the boy drifted further and further out. "And then he just went under until we couldn't see him any more." Around 1.30pm, a call was made to emergency services. 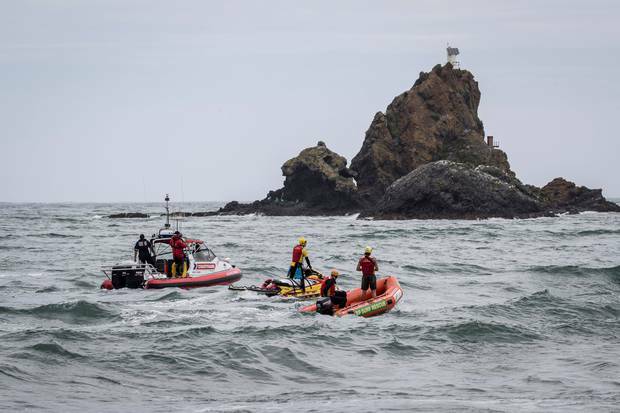 Huia fire brigade was first to arrive, followed by lifeguards from Karekare - the nearest manned beach - with jet skis and inflatable rescue boats. Whatipu, a black sand beach on the north side of the Manukau Heads known for its strong currents, does not have its own surf lifesavers. It is also isolated, an hour's drive from Auckland down a windy, unsealed road.